Temple University Press, 9781439913734, 288pp. Detractors have called it "The Mistake on the Lake." It was once America’s "Comeback City." According to author J. Mark Souther, Cleveland has long sought to defeat its perceived civic malaise. 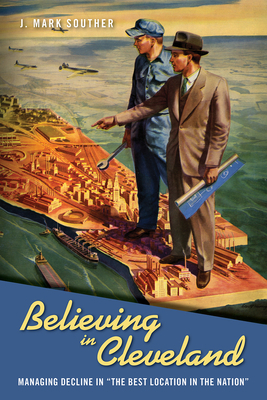 Believing in Cleveland chronicles how city leaders used imagery and rhetoric to combat and, at times, accommodate urban and economic decline. Souther explores Cleveland's downtown revitalization efforts, its neighborhood renewal and restoration projects, and its fight against deindustrialization. He shows how the city reshaped its image when it was bolstered by sports team victories. But Cleveland was not always on the upswing. Souther places the city's history in the postwar context when the city and metropolitan area were divided by uneven growth. In the 1970s, the city-suburb division was wider than ever. Believing in Cleveland recounts the long, difficult history of a city that entered the postwar period as America's sixth largest, then lost ground during a period of robust national growth. But rather than tell a tale of decline, Souther provides a fascinating story of resilience for what some folks called "The Best Location in the Nation." J. Mark Souther is Professor of History at Cleveland State University and the author of New Orleans on Parade: Tourism and the Transformation of the Crescent City.